In 1347AD bubonic plague, carried by infected Crusaders, struck Italy and spread through Europe. Helpless, doctors could only watch as the plague claimed over 42 million lives, a quarter of the population, in six years. Jews were blamed for the plague and were hanged or burned alive. Despair, chaos and economic upheaval caused a profound loss of faith in society's institutions and accelerated the decline of feudalism. Gwynne Dyer is a London based independent journalist. ON January 28, 2003 an eight-year-old girl visiting in southern China fell ill and was admitted to hospital. A week later she died, and since then her father has died of the same flu, while her nine-year-old brother lies ill in an isolation ward in Hong Kong. The virus is outwardly similar to the A (H5NI) strain, also known as "bird flu", that killed six of the eighteen people who were infected in Hong Kong in 1997. New strains that can kill human beings generally emerge by mutation as they hop back and forth between people and their domestic animals. This goes on all the time, but it's only when a virus crosses the species barrier AND THEN PASSES FROM ONE PERSON TO ANOTHER that alarm bells start to ring. They are ringing now. The "Spanish flu" of 1918 infected between 20% and 40% of the world's popula- tion and killed 20 million in four months. If a flu virus like that appeared now, could it do as much damage? Despite higher standards of sanitation and medical care in the developed world, flu death rates have not been significantly lower than in poorer countries. Viruses mutate fast, antibiotics are no use against them, and hygiene is no protection either. Bacterial diseases like cholera, anthrax and malaria have complex life cycles and mutate only slowly, so they are easy to contain, but if the latest "bird flu" is transmissible between people, we could be looking at millions of deaths over the next year. Nor is that the worst that could happen. The true nature of the "Black Death" was long a mystery, but early in the 20th Century, after doctors had found and described bubonic plague in India, experts jumped to the conclusion that a more virulent form of that disease, endemic in rats and transmitted to humans by their fleas, was the real culprit. do not respect quarantines. So two years ago Professors Christopher Duncan and Susan Scott of Liverpool University suggested in their book, Biology of Plagues, that the Black Death was really an Ebola like virus, a haemorrhagic fever transmitted directly from person to person. It is frighteningly plausible. 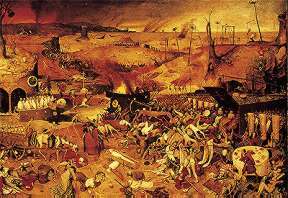 The plague called the Black Death appeared in Mongolia in the 1320s, and killed two-thirds of China's population. It reached Europe in 1347, and killed between 30 and 40% of the population in the first onslaught. The aching, the bleeding from internal organs, the red blotches on the skin were all typical of Ebola style fevers. Besides, bubonic plague, unlike the Black Death, did not disappear. There was an outbreak of bubonic plague in Glasgow in the 1890s. If Duncan and Scott are right there is a virus out there somewhere trying out mutations that might break through human genetic defences evolved to defeat it last time, which could kill a significant portion of the human race in a year. The Black Death is not dead, it's only sleeping. And in the meantime, the "bird flu" may be coming. The CDC, with Dr. Everett Koop lying daily for the Feds, mocked at the fear of AIDS becoming an epidemic. Koop lied and lied, over and over, until the truth came out.